You have to follow Him to find out what to do. God has already told us to "preach the Gospel to every creature!" (Mark 16:15)--But if you don't know where to go or how to do it, just get out and start, and He will lead you! If you obey what you know God wants you to do, then He will show you more truth; and when you obey that, He'll give you a little more. And step by step, as you follow Him, He will show you more and more. But if you don't go, He can't show! 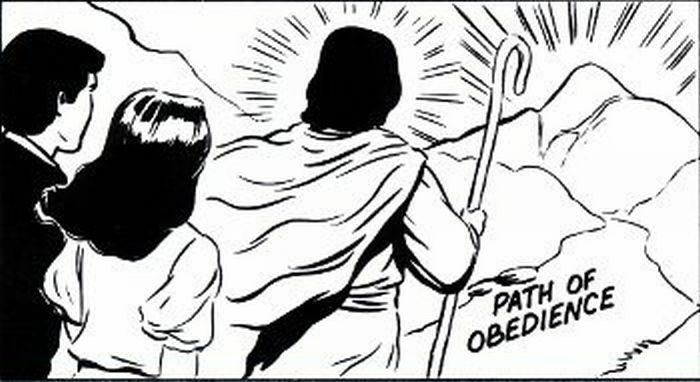 If you don't obey, He can't make a way! So follow the Lord as though everything depended on Him--which it does!--Remember to do what His Holy Spirit leads you to do so you'll be sure to stay on the right track, know where you're going, and get there. Lord, please keep us close to Thee! Help us to stay close to Thee in Thy Will, obedient, following moment by moment. Help us to follow the leadings and checks of Thy Spirit in every step we make, Lord. If we follow Thee, we'll never go wrong! "He leadeth me!--O blessed thought! 'Tis God's hand that leadeth me! For by His hand He leadeth me!"